Laura Buckley’s installations combine narrative and abstract video with sculpture and kinetics to produce immersive environments that have powerful sensory affects. Through a distinctive use of light movement and colour, and stylistic devices such as refraction, mirroring and repetition, her works engage with the legacy of formalist cinema and minimal art. Laura Buckley: This project is a record of an installation. Four of the films are documentation of a work, and one (Colourbox with coloured light flashing out of a wooden structure) is part of the original work. 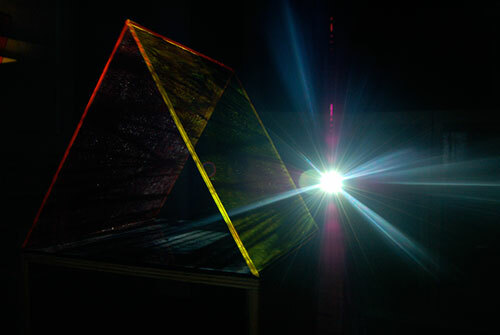 The installation was a kinetic video work, where a film projection was refracted onto the walls, ceiling and floor using a Perspex triangular prism. So it’s a sculptural projection of film, and this project is documentation of this movement. The layout of the project came about because I was watching some quicktime files that I minimized on my computer, so they were on the bottom menu and quite tiny, but still playing. I enjoyed them playing in that tiny capacity. So they are icons really, which refer to the computer as a method of exhibiting work. So it’s a play with scale and function. Its an interesting duality as I use the computer to make the work, and it has become a virtual space in which to show the work. Ellen Mara De Wachter: You use light in quite an idiosyncratic way, making it visible as a medium and causing its dispersal in space. Is this transformation of something intangible into a medium a conscious decision or a happy accident? What is it about light that attracts you? Laura Buckley: Light is everything really, its vision. And its magical. It’s the opposite of nothingness, it is focus, reality. As a child I was scared of the dark, it made me feel like I was disappearing. Dark is good, but when we are active (and visually aware) we have light. I’ve used reflective surfaces to bounce things around for a few years, so when I started making films it was a natural progression. Mirrors function like art, they reflect and represent things. When I project many films in a darkened but white walled space it creates this kind of twilight, and I hope that by encompassing the whole interior space with the movement of the image this creates a feeling of inclusion for the viewer. And the viewer becomes part of the work. Ellen Mara De Wachter: Your sculptures and installations also use movement and kinetics – some of your sculptures are revolving and they affect the route of a projection by casting reflections and prismatic distortions. Is the work influenced by the legacy of kinetic art? Laura Buckley: There were 2 shows this past year at the Serpentine that I related to, Paul Chan and Anthony McCall. I identify strongly with this work as it is sculpting light. Entering such unreal and otherworldly spaces is a very moving experience. The McCall show was the closest I’ve come to a religious experience, and I enjoyed watching the viewers as much as the work, and how they interacted with the situation. It’s the same with Olafur Eliasson, the piece he did for the Turbine Hall at Tate Modern. Phenomenological. Magic. Escapism. Ellen Mara De Wachter: You have a very distinct vocabulary of materials: plywood, perspex, digital video. You gravitate towards industrial materials in a way similar to someone like Donald Judd, who chose to work with materials which had no art historical connotations. Is there a similar desire to distance yourself from materials which may be imbued with a sense of art historical or technical tradition? Plywood is interesting because it is wood that has been remodeled, but it retains its character in the grain. It is natural and has comforting qualities. I used to paint on wood, so in a way the structures have become the supports, and I’m applying the image through the projection. Its painterly, light painting. I had issues with film as a medium because of its transience. I was missing the physicality of the object, so by projecting onto a structure I’m grounding/anchoring the digital. You can still touch the work. At Chelsea Brian Chalkley always encouraged us to break things down and see the potential in everything, somehow the supports became the subjects of my films. That’s how I got started filming. I hover between abstraction and representation, the structures are quite minimal, but the films are figurative. There’s a richness of imagery that I’m constantly trying to strip back, stripping back reality by representing it. Ellen Mara De Wachter: Sound is an interesting feature of your films and installations – especially ambient sounds, which some people may have been tempted to eliminate. What role do you think sound plays in the works and is it a guiding part of editing and composing the work? Laura Buckley: I think that sound is more immediate than the visual image. When I started making films they were silent, it was strange to work with audio. Its about control, and letting everyday life feed into the work, which can be emotional. I grew to appreciate what I could do with sound gesturally. The impact of an action. Much of my film work involves the movement of materials, repetition and percussion.